“European Commissioner for Transport Violeta Bulc on Friday announced that the EU will stop the twice-yearly changing of clocks across the continent in October 2019. [She] said EU member states would have until April 2019 to decide whether they would permanently remain on summer or winter time. Bulc said she was counting on member states and the European Parliament to keep pace with the Commission’s “ambitious” schedule. She also noted the need to find consensus among the member states in order to avoid confusing time jumps. The plan also raises the prospect of neighboring countries ending up an hour apart. 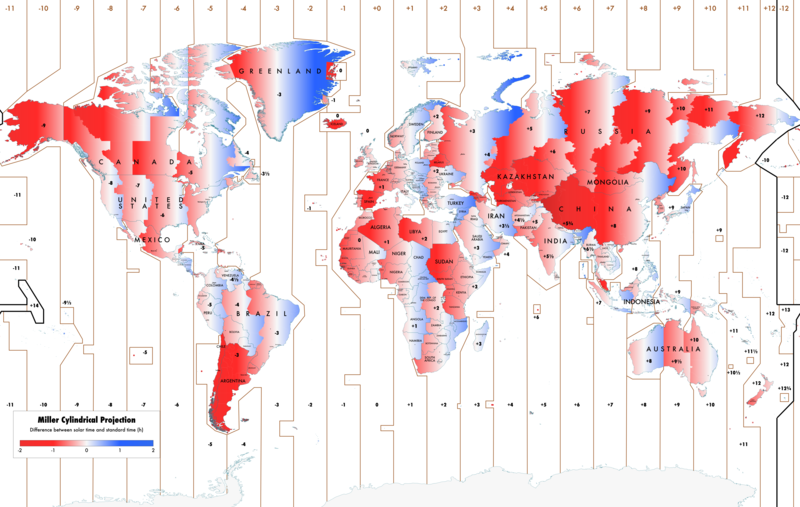 For a world-wide view on time zones and by how much noon on the clock differs from the actual time the sun reaches its highest point in the sky, see this map (PNG) by Stefano Maggiolo from The poor man’s math blog. This entry was posted in Around the World, Economics, Health, Politics on September 19, 2018 by Andrea.